As you may or may not remember, when I was in Italy last fall I became slightly obsessed with this pasta with walnut sauce the hotel in Grosseto. I ate like three helpings—the waiters kept coming around with their giant platters and giving me this knowing look, then heaping more onto my plate. I did some research on the dish and found out that it was a traditional Tuscan pasta with walnut sauce and rocket (arugula, in our world). 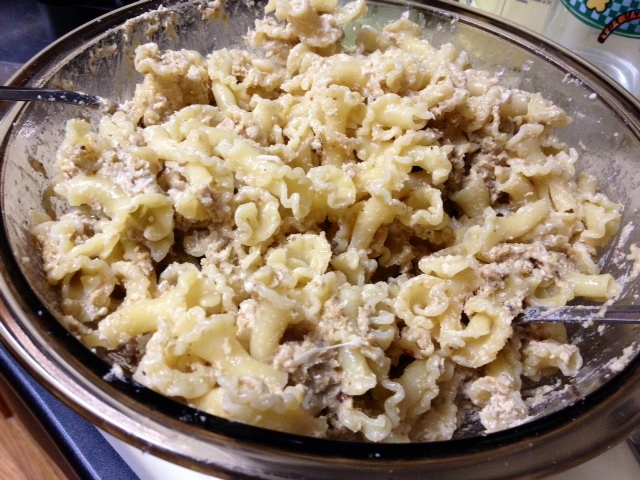 I tried recreating it once a few months ago…it was good, but not as creamy and awesome as what I had in Italy. 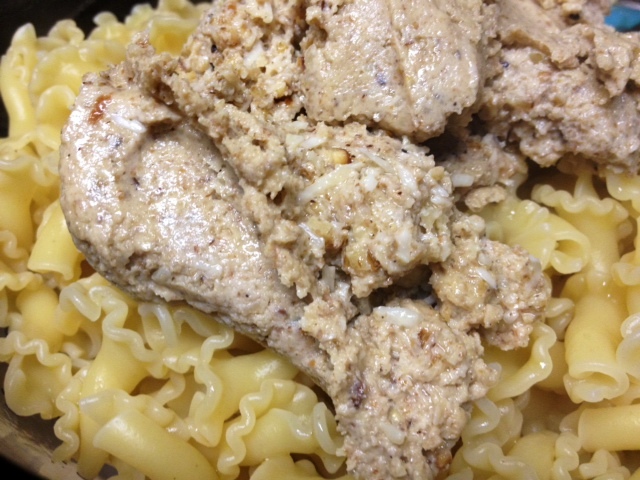 So this is the second try, a slightly different recipe. It’s been a few months in-between, so I’ll have to try really hard to directly compare the two. But know this—this pasta is VERY hearty, since the walnuts are full of protein. 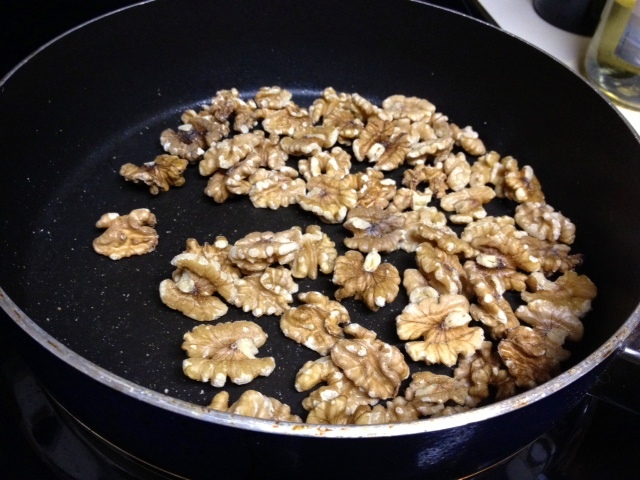 Toast the walnuts in a dry pan for a few minutes, they should have a nice, nutty aroma. But don’t let them burn! Put the bread in a bowl and cover with the milk. Let this sit for like 10 minutes. Go ahead and put a big pot of water on to boil, and cook the pasta according to the directions (with salt). 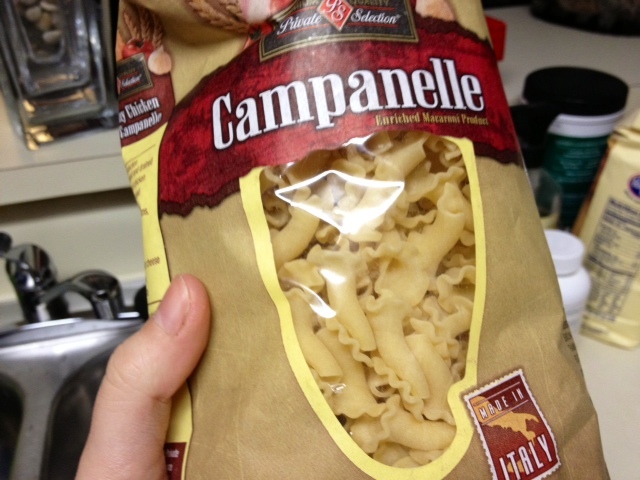 I found this fun campanelle, which is curly and ruffly and awesome. While the pasta is boiling, you’ll put together the sauce. 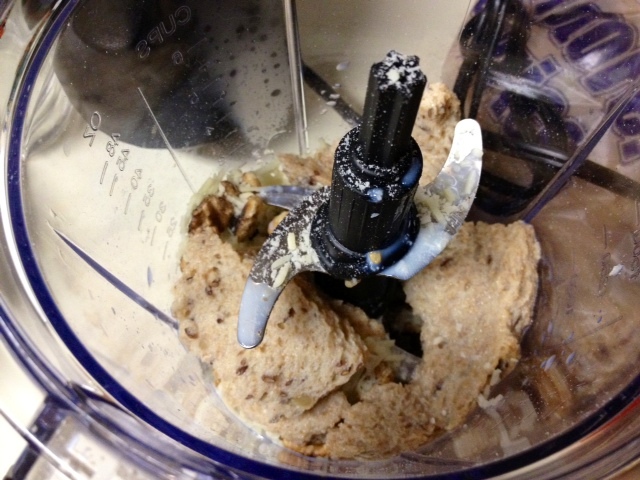 Throw most of the toasted walnuts (reserving about 1 ounce for garnish) into a food processor along with the garlic, bread soaked in milk (go ahead and throw the milk in there too), and parmesan cheese. Blend until it turns smooth and creamy, then pour in the oil and season well with salt and pepper before blending again. Drain the pasta when it’s al dente, keeping about a 1/2 cup or cup of pasta water for the sauce. Throw the pasta and the sauce in a bowl together. Sprinkle a little olive oil over the pasta and sauce to prevent it sticking together, then toss them together, splashing in a little pasta cooking liquid to make the sauce less thick if needed. Mine was actually too thick, I’d add a little more milk and pasta water next time. If you saved some of the walnuts, go ahead and roughly chop them and sprinkle them over the top of the pasta as garnish, along with some more parmesan and the chopped parsley (if you have it). 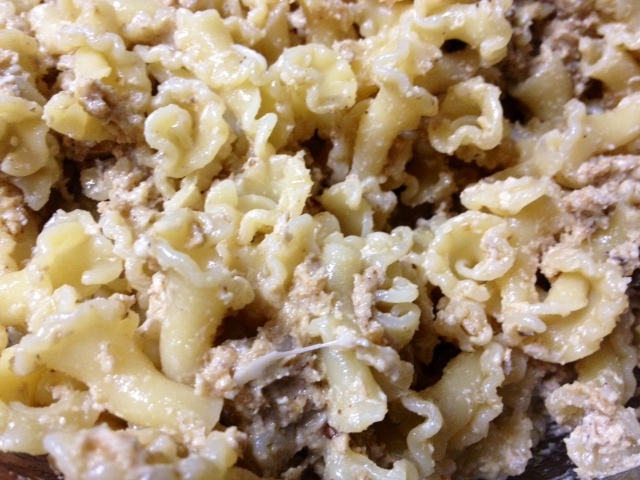 It was really good, though still not the creamy pasta wonder I had in Italy. 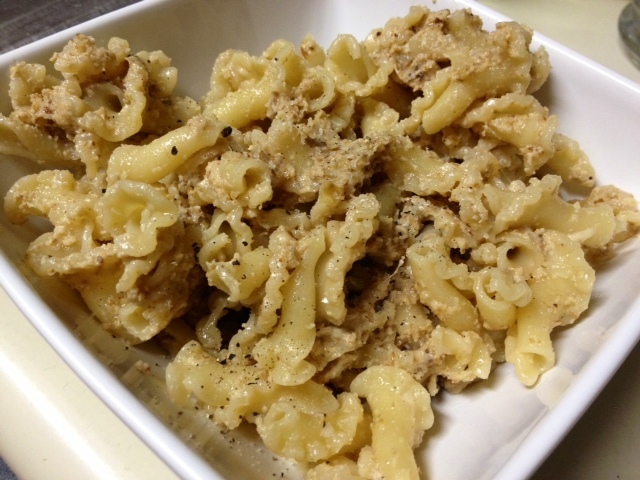 I’ll keep experimenting with these recipes, but glad to have found something that has a similar flavor. 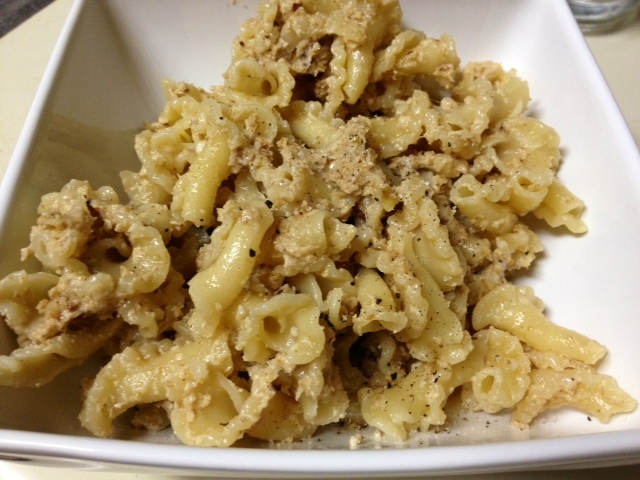 I loved both of these walnut pastas, though the first one might be my favorite. Put a large saucepan of water on to boil, and toast the walnuts in a dry frying pan until they begin to make a nutty aroma. 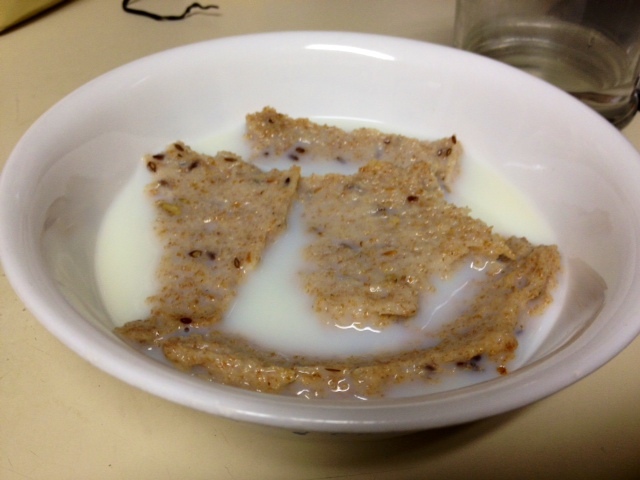 Put the bread in a bowl and cover with the milk. 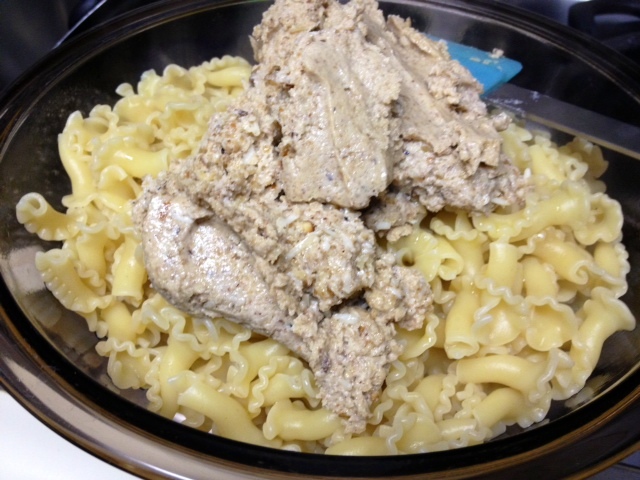 Put most of the toasted walnuts (reserving about 1 ounce for garnish) into a blender along with the garlic, bread soaked in milk, and Parmesan. Blend until it turns smooth and creamy, then pour in the oil and season well with salt and pepper before blending again. Pour into a bowl, and set aside. Add pasta to boiling water with salt and cook for the required amount of time. When pasta is al dente, reserve a cup of the pasta cooking liquid and then drain the pasta, but put it in to a large bowl while it’s still dripping slightly with water. Sprinkle a little olive oil over the pasta to prevent it sticking together, and then add the walnut sauce, mixing it into the pasta (splash in a little pasta cooking liquid to make the sauce less thick if needed).